I wrote a textbook. It all started because my kids wanted to learn specific things in life science and I wanted to teach them things. I am a former science teacher and I still hold current licensing. And I'm a crazy homeschool mama. I really started to question my sanity about half way through writing this book. When my kids were done with it, I spent another 4 months proof reading it and adding photos. I'm pretty sure there are still typos or errors in it, but I was the only editor, other than my third and fifth grader. Editing at 11pm at night is probably not the ideal situation, but sometimes it's the only time I have to get things done on the computer! This book is nearly 2 years in the making and I have a lot of time invested in it. Writing it, using it with my kids, laying it out, typing it out, and editing it. Since I have so much time into it, I thought I would self-publish it on Amazon. I would love for it to be free to everyone all the time, but I have a lot of time into this textbook and Amazon takes a hefty chunk of the list price. I will offer it for free when I can, so watch my blog, FB page, or Instagram for announcements on that. 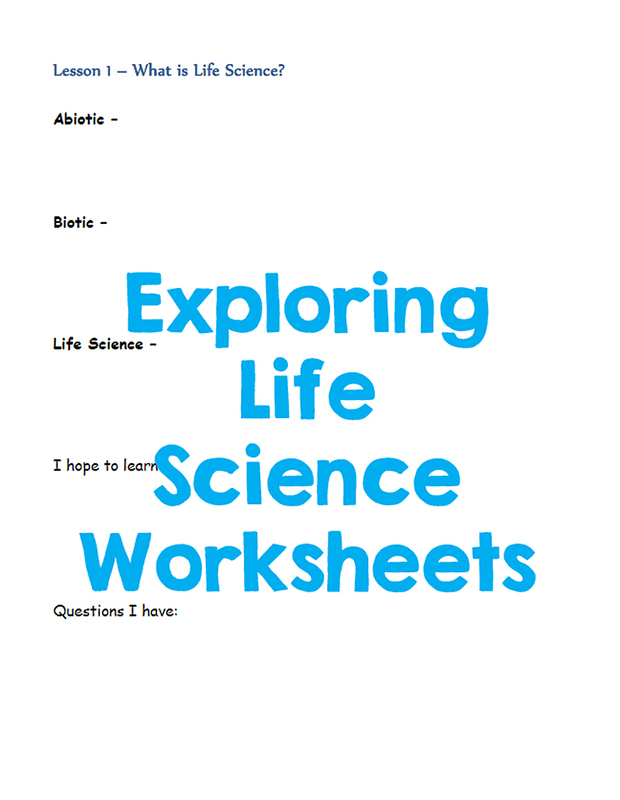 There are free printable worksheets to go with the textbook. You can find them in this blog post or a link to them in the "Homeschool" page (look at the headings on the right). 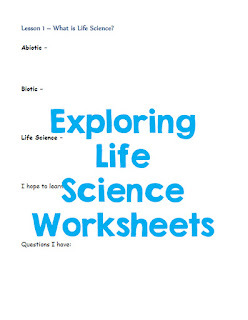 "Exploring Life Science" is a very in-depth life science curriculum. It is 120 lessons, with 60 of those as reading lessons and 60 as hands-on or exploring activities. Not every lesson has to be done, but my kids did 120 lessons. I've tried my best to include photos of labs and activities, so even if someone else can't do it, they can view it. This curriculum is for the parent/teacher and students who really want to take a school year and explore life science beyond the basics. It may seem advanced for some students and could probably work well for middle school students. I don't expect students to memorize and remember everything that they learn in the curriculum, I want them to experience science. Hopefully, further in their science career a student will remember having been exposed to these life science ideas at an earlier age. The book does include Bible quotes at the ends of some lessons. God has created quite an amazing world and an abundance of life. I'm gathering that my children like anything having to do with eating. Since candy is a rare treat, they especially liked the lessons that involved candy! Amazon will let you preview some of the book. You can see the table of contents, how the book is laid out, and view a sample of a lesson. For further reinforcement, I used two books of purchased worksheets with my kids. These were Life Science Practice and Human Body Practice. These don't need to be used with my curriculum, but they do reinforce what was learned. Otherwise, I purchased many of my science materials from Amazon and Home Science Tools. If you happen to purchase this book, thank you a million times over. If you get this book for free, you are a thrifty person after my own heart. If you use this book, I hope you have an enjoyable time just enjoying life science with your students/kids. Don't fret about getting everything done, just do what you can and take the time to observe the life around you. It is truly amazing how life works and what God has created. I found your book when it was sponsored for free on Amazon and snatched that thing up! I'll be using it with my k, 3rd and 5th grader this year and I've recommended it to several other moms! Thanks for sharing your talent! I'm so glad you got it for free and that you're going to explore science with your kiddos! I hope you find some fun activities that you enjoy. Have a great time!